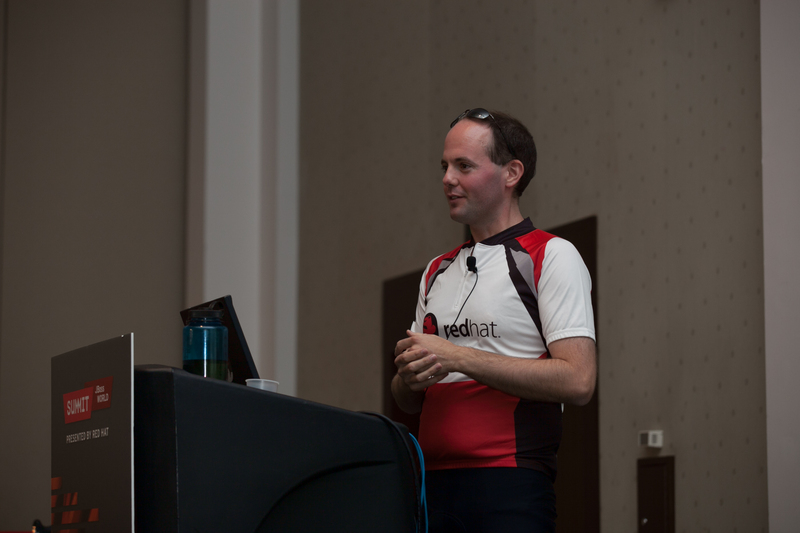 Jon Masters, Principal Software Engineer at RedHat, just finished his presentation (“Hyperscale Cloud Computing with ARM Processors”) at RedHat Summit ’12 and concluded with one of the cooler demos I’ve seen in quite some time! We sat down with Jon afterwards to get his thoughts and more detail into this very interesting topic. He’s graciously allowed us to publish his blog post here first. Hyperscale computing is a truly exciting emerging technology that, I feel, promises great things over the next few years. It will take advantage of such technology innovations as System-on-Chip (SoC), distributed fabric technologies, and integrated systems management. These are all features that are available today in Calxeda’s EnergyCore, which powers HP’s Redstone ARM servers. A complete Calxeda server node requires only three components: the SoC, memory, and storage. Together, these can be combined into extremely dense Cloud servers. Density is important because the era of cheap single-core processor performance growth is over. While the 80s and 90s saw a 52% year-on-year growth in compute performance per core on average, we’ve since reached a limit and returned to a growth rate half of that. So, the future is multi-core, and at phenominal levels of scale. With such scale comes an opportunity to rethink the conventional server design. Not only can we integrate fabric technologies (and obviate the need for discrete networking components), but we can also redesign server systems at the rack-level to take advantages of the efficiencies of scale. The use of ARM technology in these systems is key in another way. It brings a new level of energy efficiency to datacenter server designs, such as the Redstone. 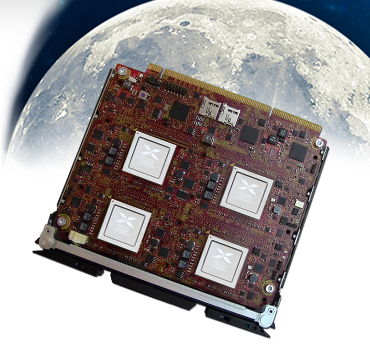 A fully loaded ARM-based Calxeda server node (including memory) draws only 5W of power. Contrast this with conventional server designs using hundreds of Watts across many discrete components, bringing significant overhead in the form of power generation, distribution, and HVAC requirements. Since the future datacenter is all about high density at scale, it will be important to design server systems with energy efficiency in mind. These systems will use less energy and so will require less energy. They will generate less heat, and will have a greatly reduced overhead in terms of the traditional infrastructure, which has been designed to run legacy servers drawing hundreds of Watts. Low energy computing has interested me personally for a number of years. At first in the embedded space, where I have worked with devices requiring under 1W of power and running for days or weeks on batteries, but now increasingly in the enterprise server space. 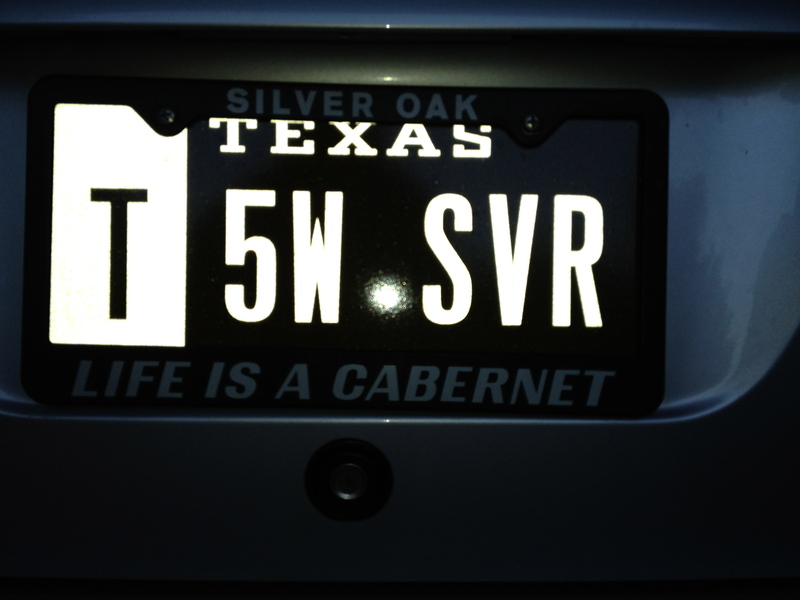 When we have server nodes that require only 5W of power, we open up whole new avenues of exploration – both in terms of technology, and in terms of fun! With this in mind, it seemed only natural to find a way to truly visualize the low energy aspect of these emerging hyperscale server systems. Solar power is certainly an option. It’s a well-known, tried-and-tested technology that many people are familiar with. But I wanted to find something more novel and unique, more directly connected with the user and audience. The idea was suggested: why not use a bicycle? Bicycle generators have been used to power all kinds of things over the years, but to my knowledge they’ve never been used to power servers. With this in mind, I designed and built what I think is the world’s first bicycle powered hyperscale server rig. 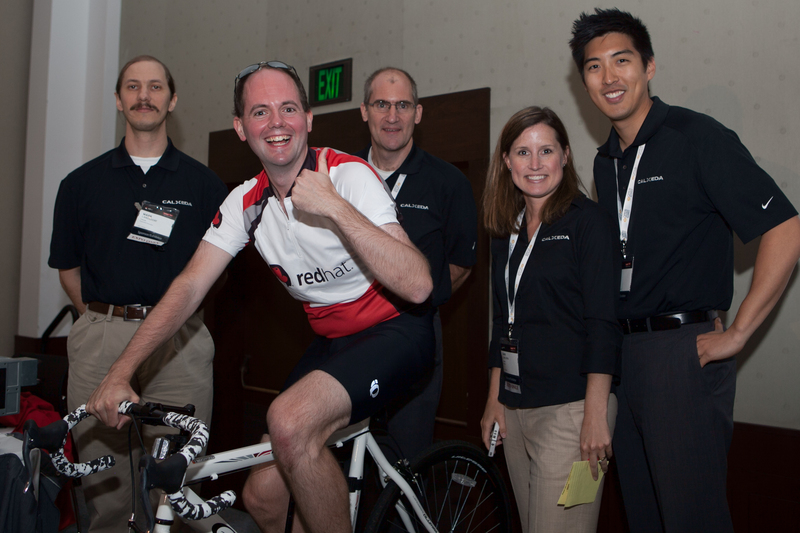 The rig was used during my HP Redstone Server demo at the 2012 Red Hat Summit. It consists of a bicycle, attached to a generator via a friction bearing, the output of which is fed into a repurposed solar-charging circuit. 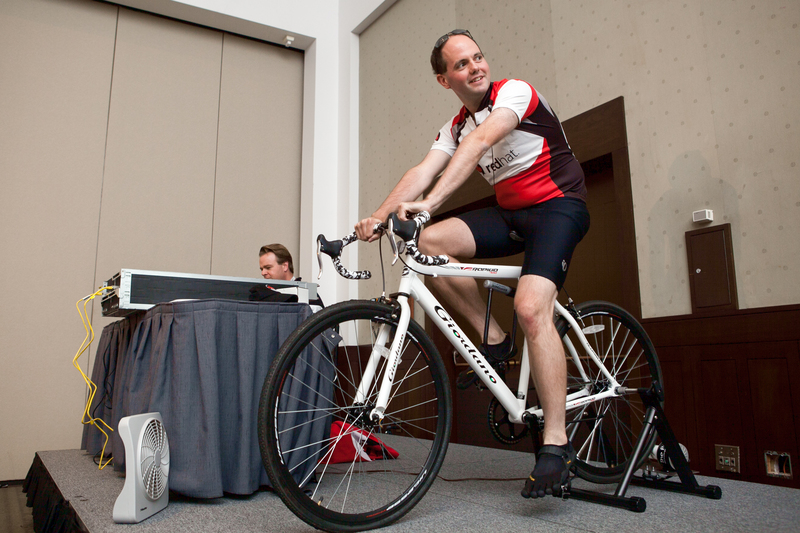 The bike generator easily produces up to several hundred Watts, which trickle charges a battery that powers the server. Some smoothing circuitry is also added to prevent damage to the server as the pedal power is applied and removed, and a fan is attached to divert any excess power produced (which happens frequently), cooling the rider down. Finally, a series of multi-meters and some custom software is used to graph the instantaneous power generated by the rig as the rider pedals away. Using this rig, I have successfully powered the HP Redstone server while generating up to 200W of power on an average bicycle. At 5W per server node, that’s a lot of ARM server nodes that can be powered by one bicycle! We couldn’t have said it better ourselves! Check out the pictures from the demo below! Update: Some people have asked us what was actually running on the server for the demo. Each of the four nodes was running Fedora 17 GA and a distributed Mandelbrot demo using OpenMPI across 32 cores (8 Calxeda EnergyCores). 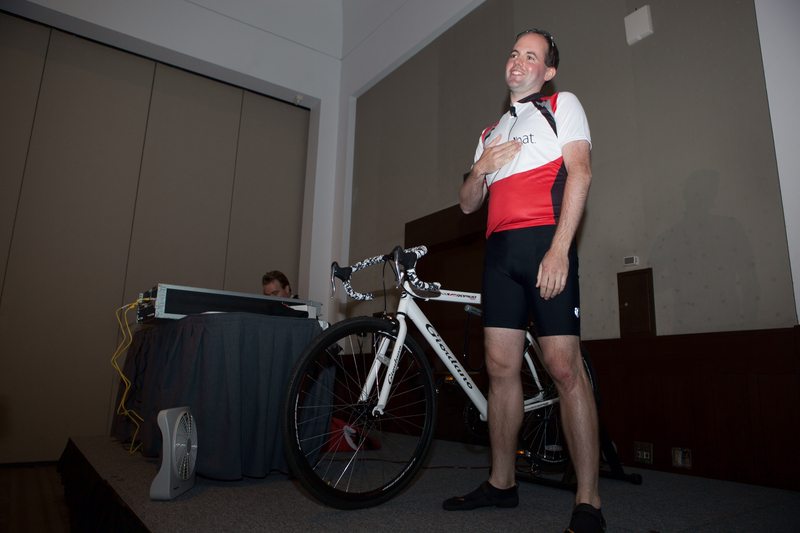 Subtle, but this was the first public demo of Fedora on ARM that we are aware of…all powered by a bicycle! LIVE from Computex in Taipei! Computex is one of the world’s largest technology events held every year. This year the conference is expected to draw over 36,000 attendees to its multiple exhibit halls across the entire city of Taipei. We didn’t want to miss out on the action, especially given Calxeda’s recent announcement launching our local presence in the region, so we have a team here in Taipei. We’re here both to support our partners and also give attendees an in-person view of a live system running similar demos from the announcement last month at UDS. If you’re interested in following us during this week, click the read more link to get more detailed updates throughout this week! 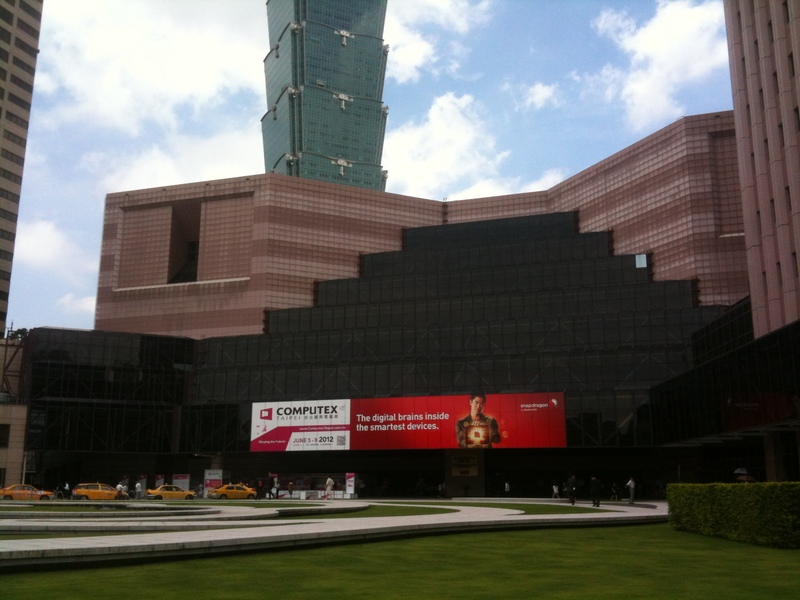 Or better yet, if you’re one of the lucky ones here in Taipei with us this week, let us know and swing by to say hello!